The City of Eureka has started a program to bring the visual arts to the community for all citizens and visitors to enjoy. 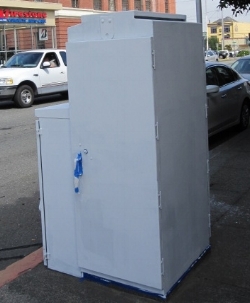 They have partnered with CalTrans to have the traffic light utility boxes painted by local artists and sponsored by businesses and individuals. Several boxes have been completed and are now decorating various corners of the City with bright paintings. I decided to add one of my creations to the mixture. My sponsor is Donna Wright, the executive director of the Eureka Chamber of Commerce, and her husband Philip. Donna envisioned having butterflies on a box, and I enjoy painting them, so it was a perfect fit. I cleaned and primed the box last weekend, and Monday morning the first coat of paint was applied. After a second coat the box was ready for the butterflies, along with some flowers, to brighten up a very busy corner in Eureka. If you're in the area, it's on the northeastern corner of 6th and H Streets. I hope you'll drive by and see the development. I will be posting photos of the box as it transforms from unnoticed utilitarian to a piece of community art. Thank you City of Eureka !